Aerial view of the Don Guanella Village property in Marple Township, Delaware County. 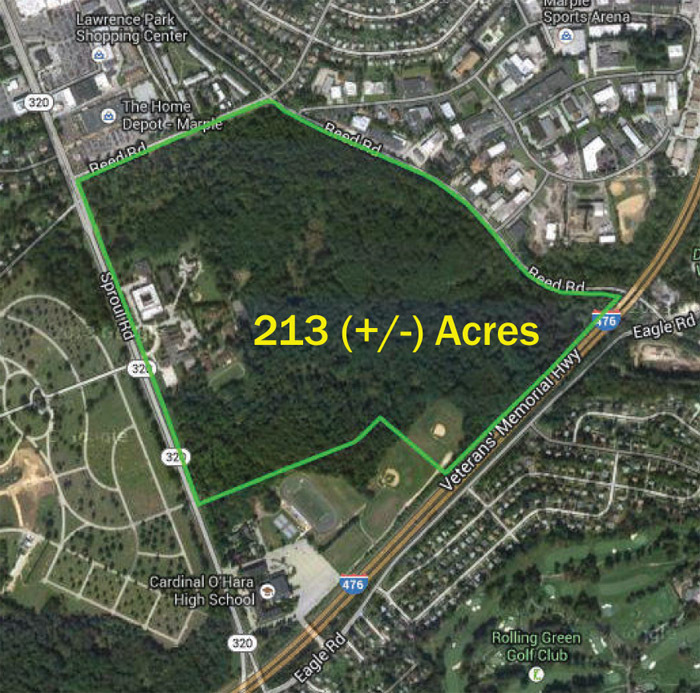 An agreement of sale for the 213-acre former campus of Don Guanella Village in Marple Township, Delaware County, by the Archdiocese of Philadelphia to Goodman Properties has expired and been terminated, it was announced by the archdiocese on July 1. Don Guanella Village, which was founded by the archdiocese in 1960 to serve young men and boys with cognitive and developmental disabilities, was in the process is dispersing the now mostly aging residents to smaller community-based sites, in keeping with current social thinking, when the announcement to sell was made in October 2014. Under the agreement with Bruce Goodman of Goodman Properties the sale, which was subject to Vatican approval, would result in the payment of approximately $47 million to the archdiocese. But the deal was not finalized pending zoning approval from Marple Township for the complex development plan. The proceeds from the sale were earmarked for payment to the archdiocese’s seriously underfunded Deposit and Loan Fund, which like a bank accepts deposits from parishes and lends funds to other parishes with needs. The ambitious development plan calls for retail stores, an office building and housing in what would be called the Cardinal Crossing Town Center. Don Guanella Village itself takes up only a small portion of the property, which is heavily wooded and undeveloped to date, probably because it is hilly in part and has a small creek running near its border. The sale and the development plans have met with community resistance because it is considered the largest virgin property left in the area. The Don Guanella land is just one part of an even larger tract assembled mostly a century ago through purchases under Archbishop Edmond Prendergast. A major portion, larger than the Don Guanella part, is taken up by SS. Peter and Paul Cemetery, Cardinal O’Hara High School and Divine Providence Village, a facility for women with cognitive disabilities similar to Don Guanella. The land, which runs along Sproul Road, was purchased by the archdiocese at market price in bits and pieces over a decade or so from such owners as the Sproul family, the Walker family and others, according to Dave Stavetski, a real estate specialist with the archdiocese. It appears the cemetery was the sole purpose of the acquisitions at the time because the high school and two special schools did not come along until much later. The only notable diminishment of the property came when the Commonwealth of Pennsylvania purchased land from it under eminent domain for the construction of the Blue Route highway, Interstate 476. Now that the agreement with Goodman has expired, community groups are discussing the possibility of either the county or the township buying the land for preservation purposes, perhaps through a bond sale. It is by no means certain there is sufficient support for this. Whatever happens, the archdiocese still needs the money for the Trust and Loan Fund, and Goodman Properties wasn’t the only bidder. We now have a possible new site for the Seminary.